Need a portable charger? Here's your chance to win one. Open to US residents only, you have through 6/16 to enter. Good luck. If you travel a lot or planning on a fun family vacation this Summer, the myCharge HubMini Portable Charger is the perfect way to stay charged up! It is the smallest charger, with the largest power, compared to its competitors. It has 3300mAh charge and is ultra light weight. 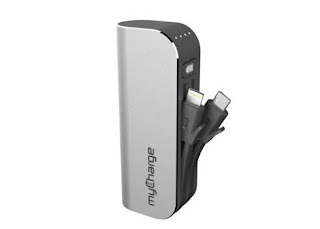 myCharge is a Michigan-based manufacturer of portable charging solutions and has been first to market offering the most advanced solutions for a multitude of needs. We know how important it is to stay connected to the people and things you love, and we work passionately to create products that do just this. Be sure and read Kristin's thoughts on the myCharge HubMini Portable Charger in her full review here! No one likes to get caught with a dead battery! So, how would you like a chance to win your very own myCharge HubMini Portable Charger? The giveaway ends 06/16/18. Giveaway is open to US Residents, ages 18+ years of age. I would use it most to keep my phone charged when traveling. 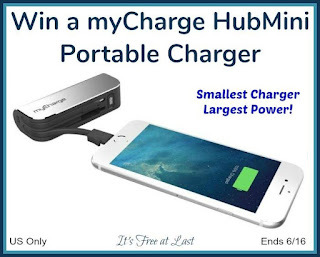 I would love to use the myCharge HubMini Portable Charger for my long train commute back and forth to work every day! This would be the perfect power source for my devices! I have a older phone that does not hold a charge so it would go with me in my purse all the time. When I am out and about.